Last year, 2018, marked the 90th continuous year of exhibition by the Pemaquid Group of Artists. We will open for the next season in May of 2019 for our 59th year of showing our work in Lighthouse Park. We hope you will return to the site often and visit the gallery, which will be open on May 25-27th, June 1-2nd and then daily from June 7th through October 14, 2019. 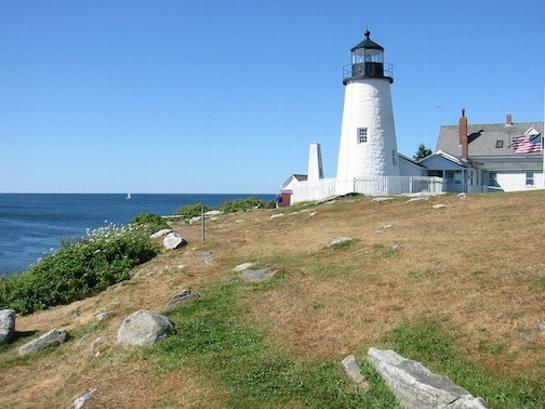 Pemaquid Art Gallery is uniquely situated within Lighthouse Park, renowned for its panoramic views of the sea, sky and rocky shore. Run by the Pemaquid Group of Artists, the Gallery is also conveniently located close to many other summer art galleries and attractions in mid-coast Maine. Our Mission is to provide a venue for qualified area artists, enrich the cultural environment for area residents and visitors, and foster and support art education through financial donations. Prospective members are juried from among resident artists of Lincoln County, Maine. The group includes both regionally and nationally known artists. The gallery exhibits the work of group members and on occasion, special invited artists of artistic renown.